Today marks the autumn equinox, the point in which the centre of the sun is directly over the equator, and thereafter will be centred over the Southern Hemisphere. 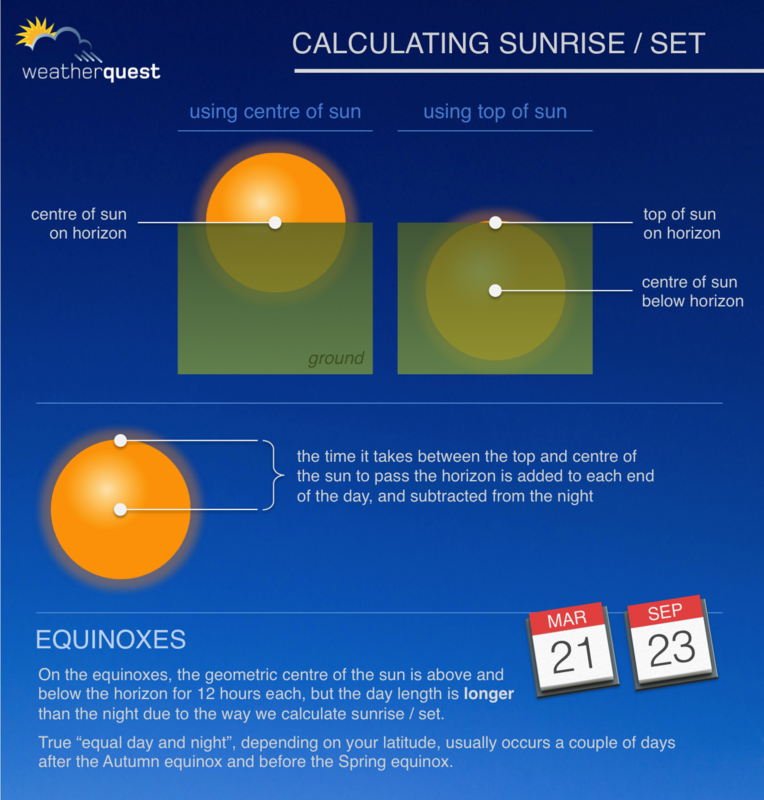 Equinox derives from latin for "equal night", and while the sun spends roughly an equal amount of time (12 hours) above and below the horizon across the Earth, the length of the local daylight is not equal to the hours of darkness. The reason for this is because we measure sunrise to be the time at which the top of the sun becomes visible at/above the horizon, and likewise sunset is when the top of the sun vanishes at/below the horizon. The centre of the sun is still yet to reach the horizon in the case of sunrise, and equally goes below the horizon before sunset. This added time at sunrise and sunset means the day is actually still longer than the night at the equinox, and in the case of East Anglia today's day length is approximately 12hours 10minutes. Hence, "equal day equal night" is more applicable, in terms of how we measure sunrise and sunset, a couple of days later, i.e. 25th September where day and night are roughly 12 hours apiece. Likewise in spring, it will be a couple of days before the vernal equinox.